One of the biggest perks of extending your home is making it far more practical and valuable. You can add a garage, a bedroom, a dining room, or multiple rooms. You could even create a game’s room. Providing you do this properly, you’ll find your home is far more functional for your family, and adds value to the selling price for the future. All you need to do is bear in mind that some renovations won’t necessarily add value – adding a swimming pool might seem like a huge luxury, but if your property is suitable for families, people won’t want to put their kids in danger and will likely not put in an offer on the property. You also need to be sure that you’re not creating an eyesore for other people – this is a legal requirement. In some cases, it may be more beneficial for you to buy a new home. However, some people would like to remain in the house they’ve created so many memories in, so both options have pros and cons. When you decide to go through with an extension, you’re going to experience disruption to your home life. You can find companies that aim to minimise this disruption as much as possible, but you should still expect noise, mess, and other things that will make living at home a lot less relaxing. This is another reason some people choose to move rather than extend. The amount of time their home life would be in disarray can seriously mess up routines, and isn’t great if people work from home. Once you’ve decided that you’re going to have an extension, you need to make sure that you can get legal permission to do it. You will usually need to apply for planning permission from a local authority, and you may need things like building surveys to ensure there will be no problems later on down the line. This is another expense to consider, so make sure you take everything into account. When considering the cost of your extension, you can only really get a ballpark figure. As different things can affect how long the extension takes and the materials used, you won’t really know how much it is until the work is carried out. This is why getting a company who are transparent about price is crucial. You also need to take into account things like whether you want an architect to draw up the plans and a project manager to keep things running smoothly. Does an extension sound like too much hassle to you, or the next logical step for your home? Buddy is well on the way now with his Wainwrights dog food review. Following his operation we have left it until now to give you his next update as he was on medication and we wanted to wait until they was fully out of his system before his next update and his Wainwright’s dog food review. 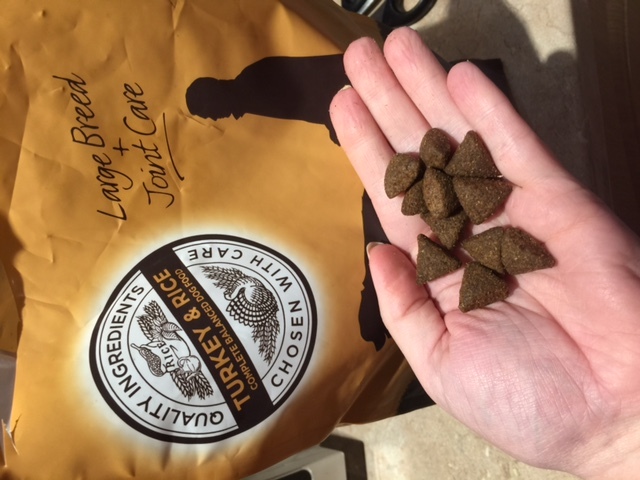 We have been recently having a closer look at Buddy’s food as we felt that his old brand of dog food did not agree with him so we wrote a list of our concerns and discussed them during Buddy’s nutrition consultation at pet’s at home. We did not feel that Buddy was getting enough out of his meals as he always seemed to be hungry. Buddy seemed to be loose all the time when going to the toilet. He seemed to open his bowels a lot during the day. 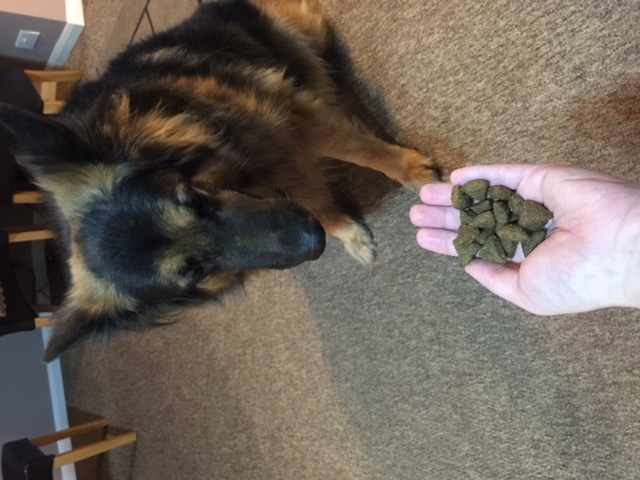 Buddy has allergies and we have to be careful what we give him to eat. Buddy also has a very sensitive stomach. We was not sure if the food Buddy was on was the right food for his allergies. We put our list of concerns across during our consultation, we discussed what food he was currently on and was amazed by how much Buddy’s food was wrong for him we totally had him on the wrong food and was pointed in the right direction to a choice of other brands of food that will suit Buddy’s health concerns and allergies. During the consultation we had a close look at other choices available to him whilst discussing our concerns we had. We found the consultation very helpful and very informative, all questions had been answered and we found the staff extremely helpful. 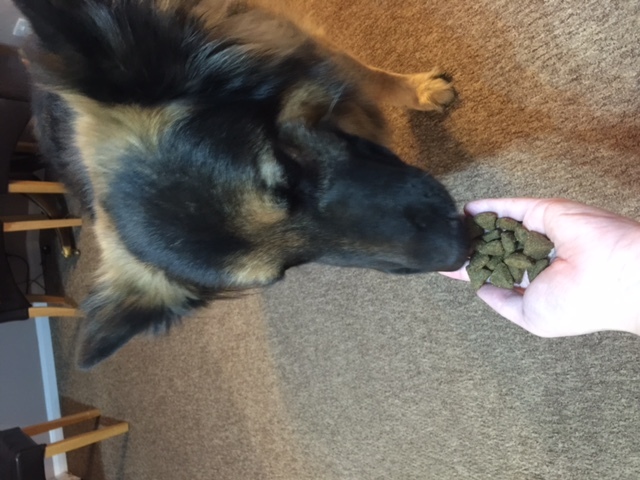 The food we chose for Buddy was Wainwright’s, we have really enjoyed looking into what Buddy is eating during this Wainwright’s dog food review and we are really pleased to have found a suitable food for Buddy that has all what he is needing. Wainwright’s dog food don’t use wheat, mixed meat proteins or any ingredients known to commonly cause allergies. because of this Wainwright’s provide a nutritious meal for pets that is easily digested and hypoallergenic. The ingredients that go into Wainwright’s food are carefully selected to provide protein, carbohydrates vitamins and minerals all the goodness that any pets needs. He seems to be more full. He no longer cries for more food. His bowel movements are no longer loose. He is sleeping for longer periods of time than he was when on the other food. He appears to have more energy and be more playful. His allergies seem to of eased off a bit. 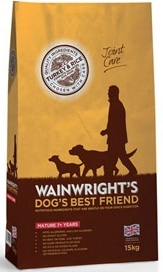 We have also noticed that there is more of a variety to choose from with Wainwright’s dog food. Our thoughts of the change so far are: Buddy seems like he is really enjoying the new food he has been trying and we have noticed some excellent changes in Buddy’s eating habits, sleeping pattern, his behaviour and his energy levels. All the noted changes have been for the better which can only be a good thing…Right? We are going to monitor Buddy for a while longer on the food and see if the changes continue to stay, fingers crossed. Are you happy with the food your pet is on at the moment? if you are considering a change pets at home was a great help to us. Disclaimer: we received a supply of food to see Buddy through the set challenge. All thoughts and opinions are 100% our own. 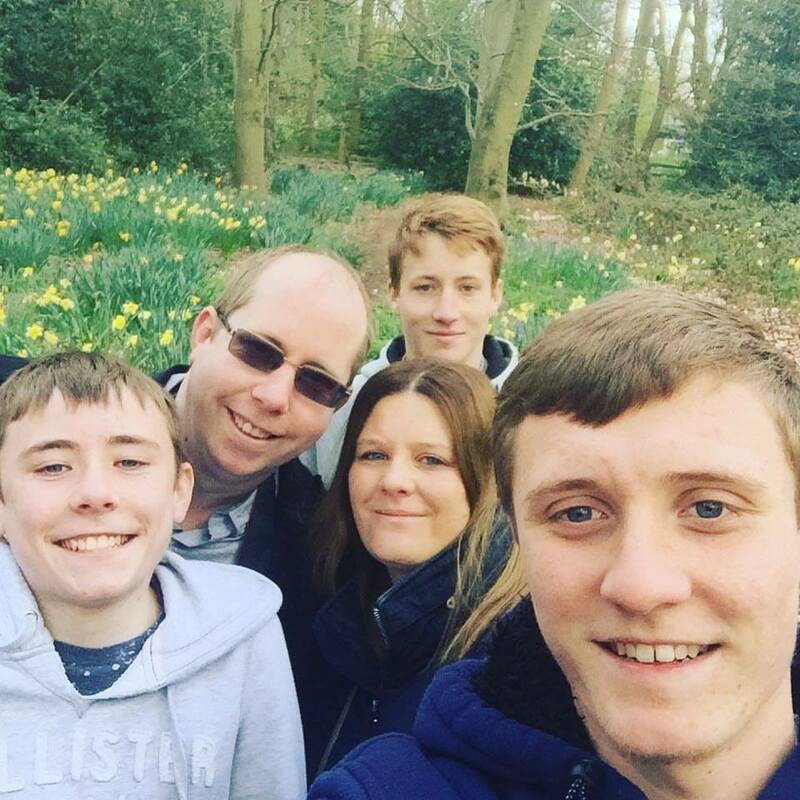 We recently enjoyed a nice family day out, guess where we went? 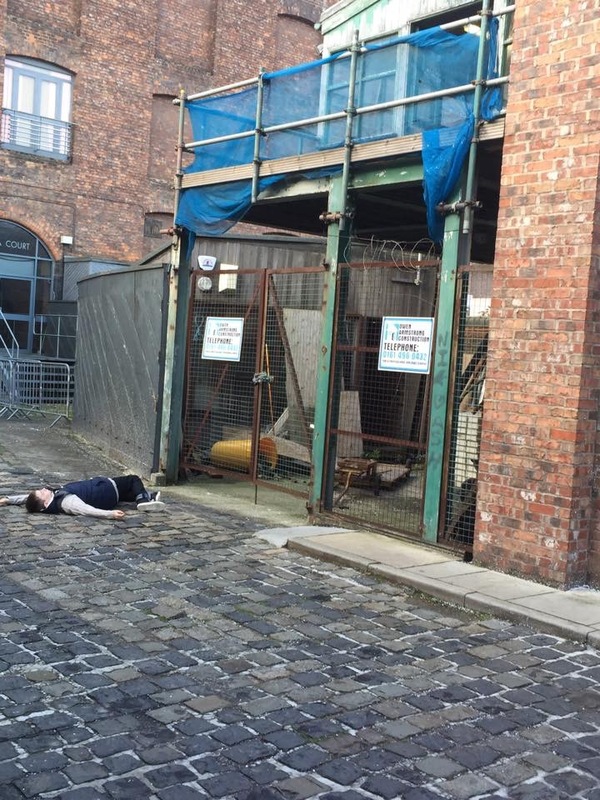 we only went and walked on the famous cobbles of coronation street, it was amazing and felt so strange walking down a street that we have watched on our TV for years. Whilst on tour we went back stage, we sat in whats known as the green room, this is where the cast would sit when not filming. We went to the dressing room area of the cast and then we went in the wardrobe area and saw some of the famous wedding dresses, coats etc. 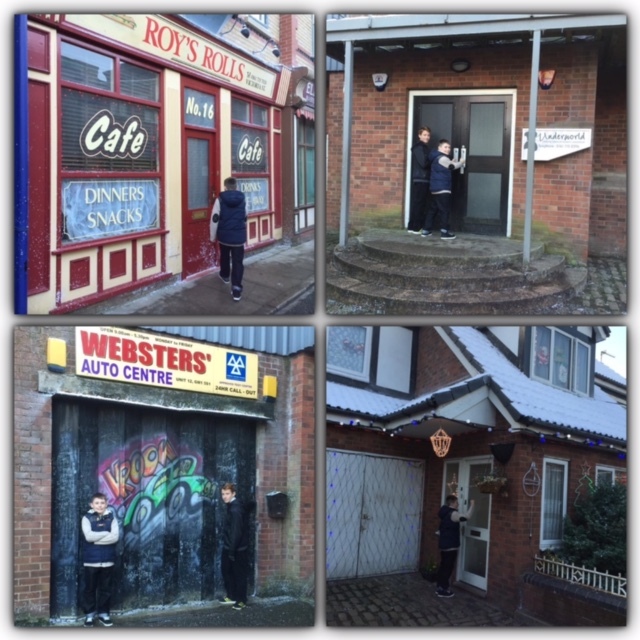 We then went in the studio area and was shown the homes of the Platt’s, Duckworth’s/Dobb’s, Carla’s flat, underworld and the one and only Rovers Return. 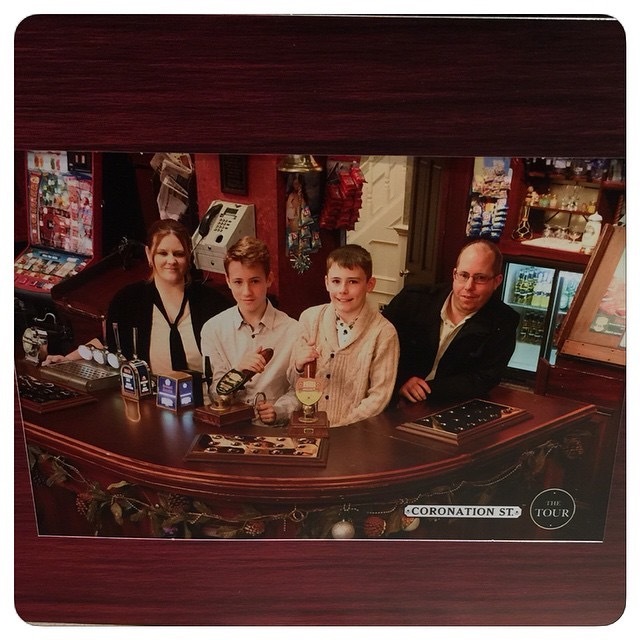 Whilst in the rovers there was a chance for a photo behind the bar. 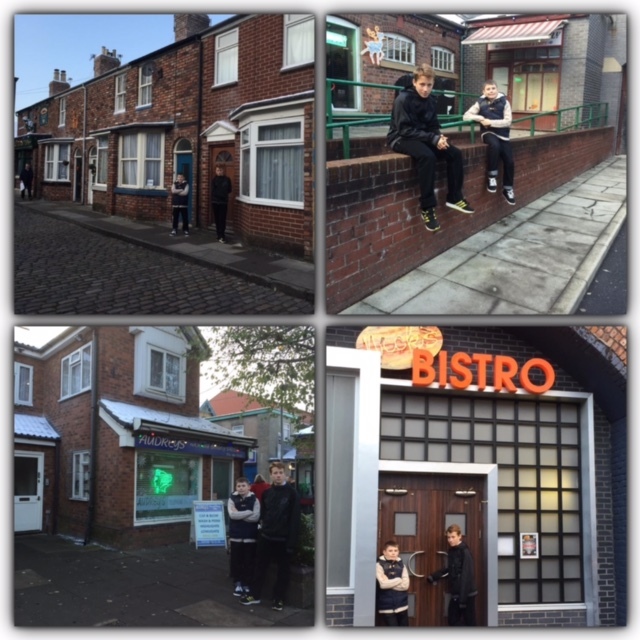 It was amazing to be shown where some of the main story lines have been filmed. Whilst backstage we saw some of the props and memorabilia from coronation streets history. 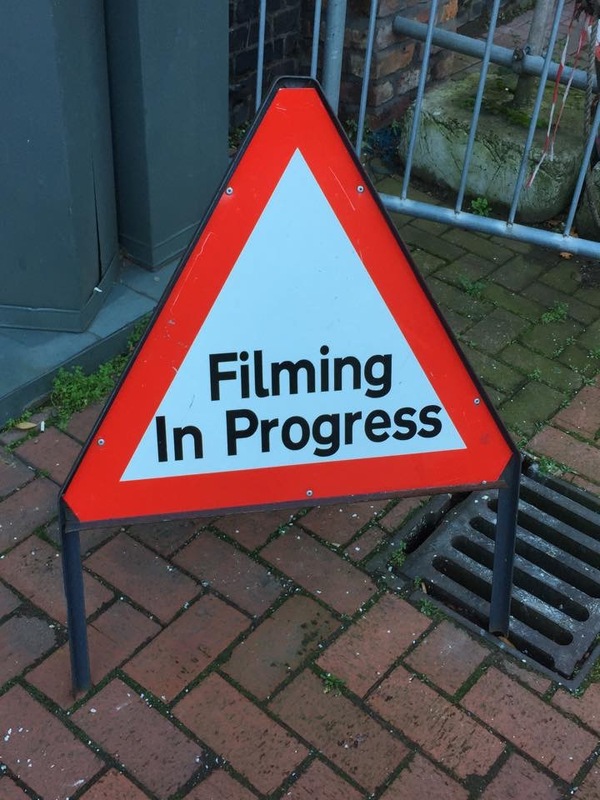 We even saw the crews filming area, the TV’s and cameras used to film, we was told roughly the number of hour’s put into episodes, it was truly amazing to get an insight to how the show was made. 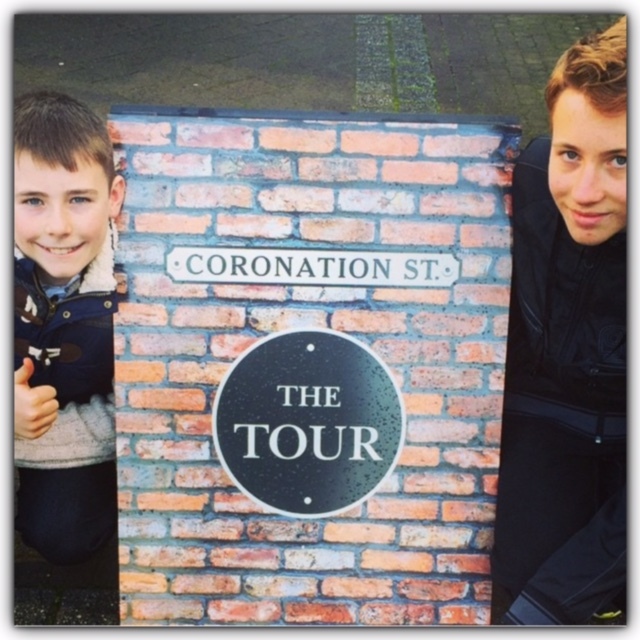 After a guided tour round the studio we then went out and walked on the famous cobbles, knocked on some of the doors, we all had an amazing experience especially the boys as they are just as much of a fan as we are. As we walked up the street the boy’s would say who lives where, everyone was amazed at how much of a fan the boy’s are. 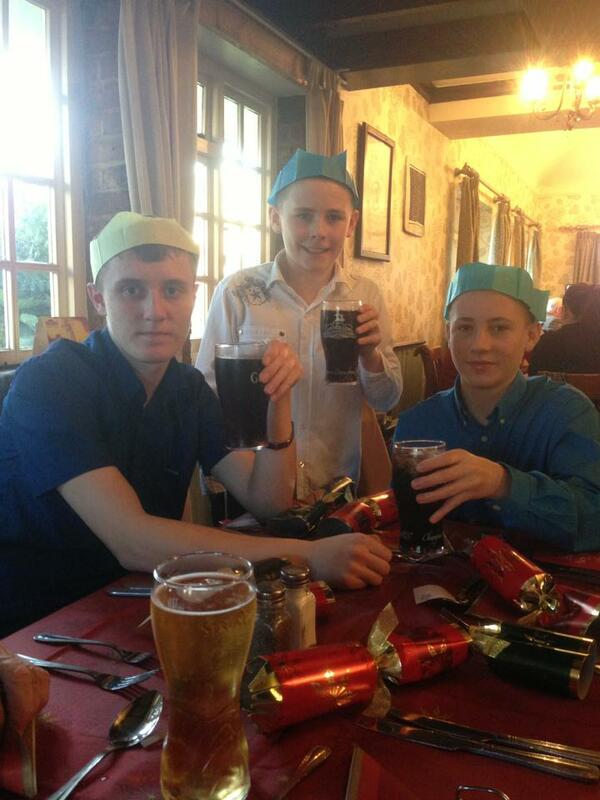 Here are some photo’s of the boy’s acting out being extras….Take 1. Bradley enjoyed acting out Tina’s death scene. 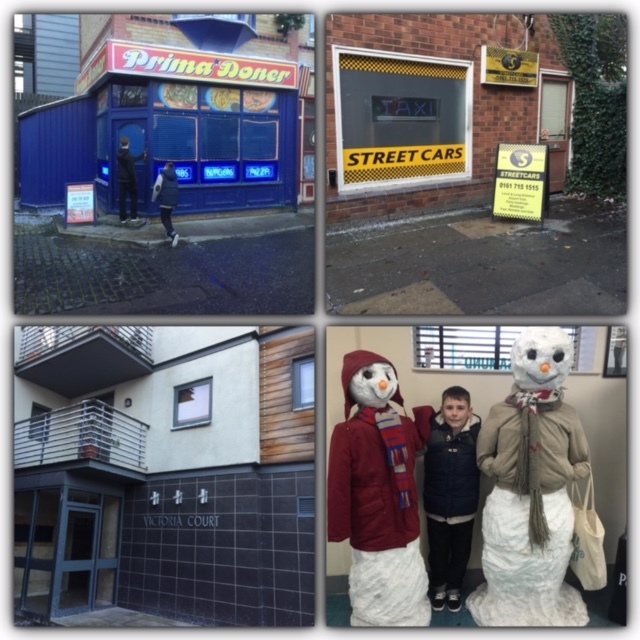 After a little bit of fun and acting out some of our favourite scenes we continued our tour of the street, we was lucky enough to experience the festive side of the street while on tour, the fairy lights was twinkling away, the houses had their decorations up and there was snow-covered roof tops. 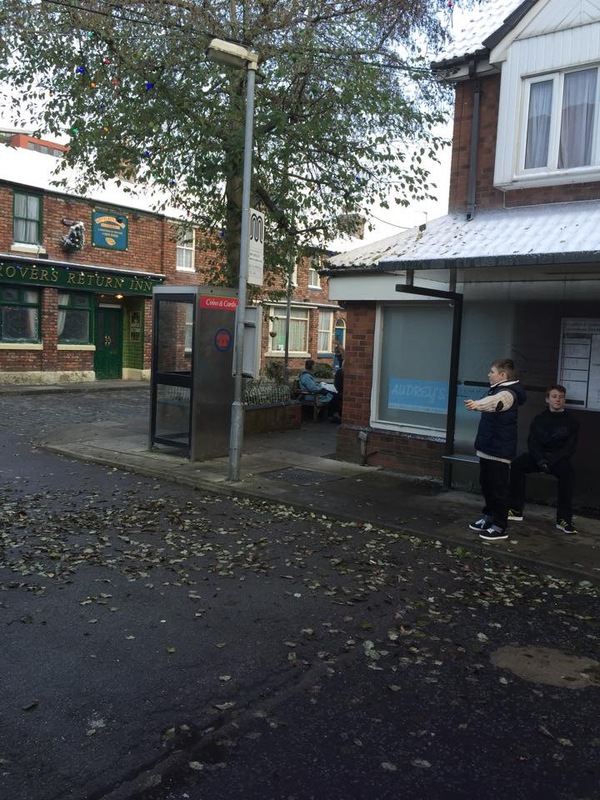 Photo’s of the boy’s being extras…..Take 2. The overall experience was fantastic, we all really enjoyed ourselves, when we watch Coronation street on TV now we can now picture it a bit more. 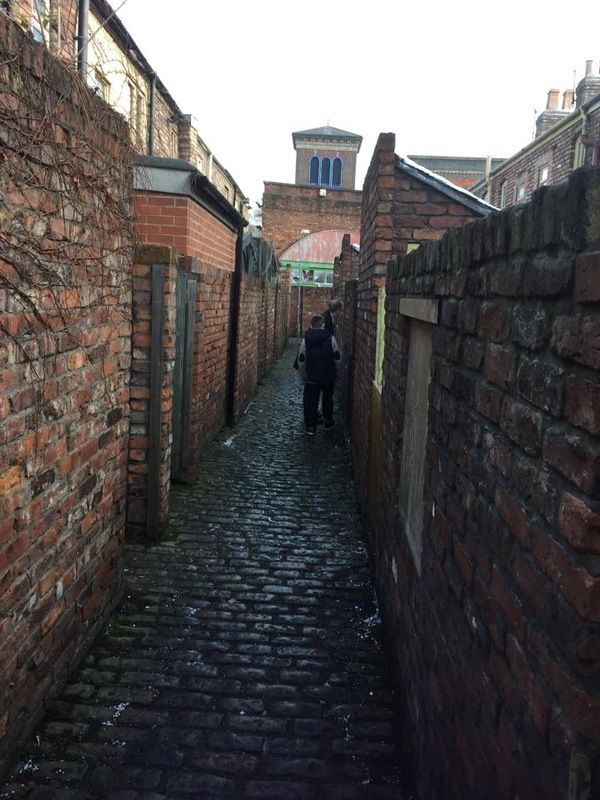 We could not resist a walk up the famous ginnel and a peek in the back gardens…Look at Ian and Brad being peeping toms! 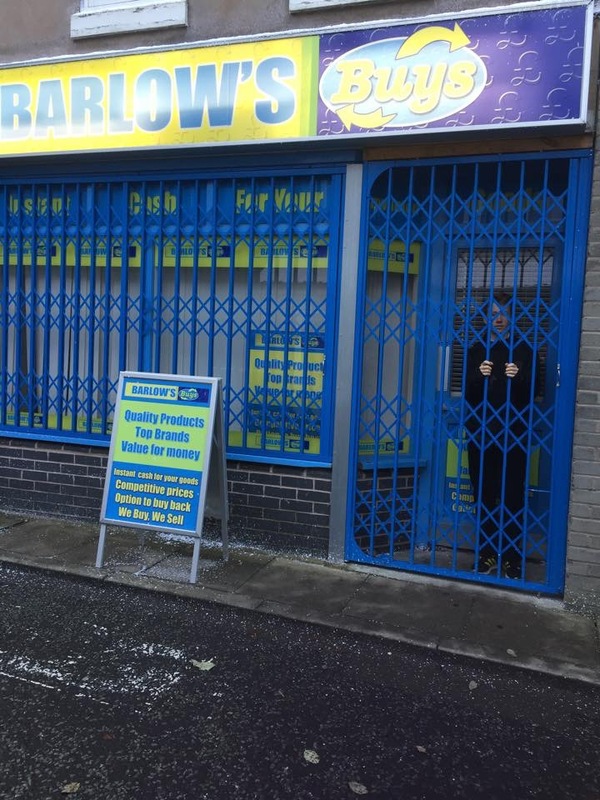 Whilst on the street we thought we would call by Barlow’s Buys. Then that was the end of a fantastic tour of the street, we all had a brilliant day, the boy’s loved the role of acting out being extras (acting out as extra’s was our own made family fun whilst on tour) when walking round the street it was great that we could just walk around at our own leisure, there was plenty of fantastic photo opportunities, the kid’s had great fun posing as actors/extras. If you are a Coronation street fan or know someone who is, this would make an amazing experience. You can find tour information here. Disclaimer: we received tickets to tour the street for the purpose of our review. All thoughts and opinions are 100% our own. Do your kids love santa? Do they love science experiments? Would they love to see the two put together? Have you heard of The Santa Claus Experiment Show? Let me tell you quickly about the show, it is at the Bloomsbury Theater from Monday 15th December – 21st December. The show is recommended for ages 6+ that would love to see animations live on stage and stand up comedians. 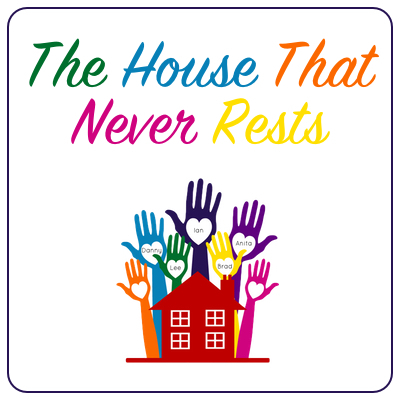 Written by Howard Read (CBeebie’s Little Howard’s Big Question) and Tiernan Diouieb (Comedy Club For Kid’s), directed by Jon Spooner (CBeebie’s Panto, Unlimited Theatre), you can imagine how brilliant this show is going to be. Does this sound like the kind of show you would love to go and see, what is not to like, there is going to be live animations, santa, Elf and safety inspection’s and ……oh no Santa gets arrested! If you would like to find out if Santa is released in time for christmas, book your tickets for The Santa Claus Science Experiment, the last showing of the show is 2.30pm on the 21st December. Can Christmas go ahead without Christmas magic? 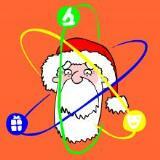 can Santa’s elves and a genuine actual scientists save the day using science?…..We will have to wait and see. If you love to laugh and love experiments, this is the show for you. We already have our tickets booked to attend on Saturday, our boy’s love science experiments and we all love Christmas, so we are all looking forward to show. We have our fingers crossed that the elves can save Santa in time for Christmas using science. We will be there sharing our Christmas magic and cheering the elves on. Disclaimer: we have been given tickets to attend the show for the purpose of a review…. (review to follow). 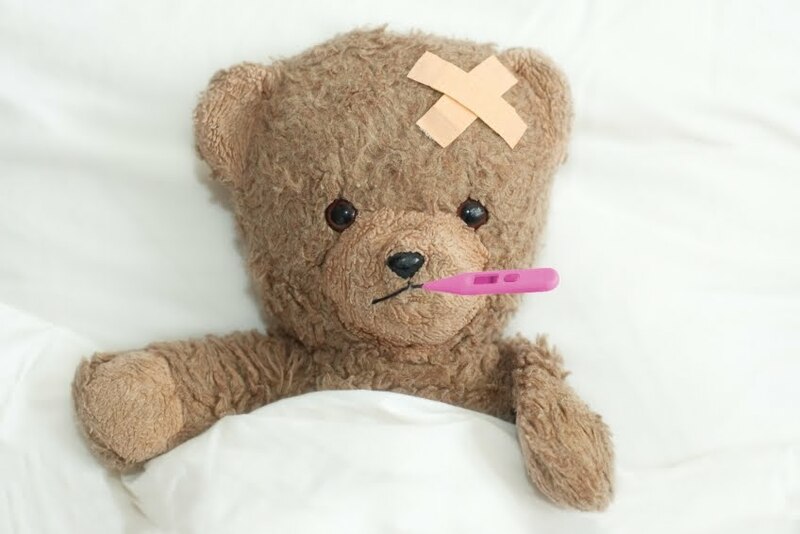 Those long dark cold nights are now here, it’s that time of the year where all the thick warmer socks, winter duvet and electric blankets are all being dug out and you just want to snuggle up with a nice blanket and a nice hot drink on those horrid cold wet wintry days/nights. We have been able to nicely snuggle up and keep lovely and warm with the help of this cosy thermal blanket. This is a 1.4 tog rating blanket and feels so luxuriously soft. The blanket is a very generous size of 180cm x 200cm so you can really wrap yourself up in it and keep lovely and warm. We like to have movie days/nights and we have found ourselves all nicely wrapped up cosy and warm……perfect! 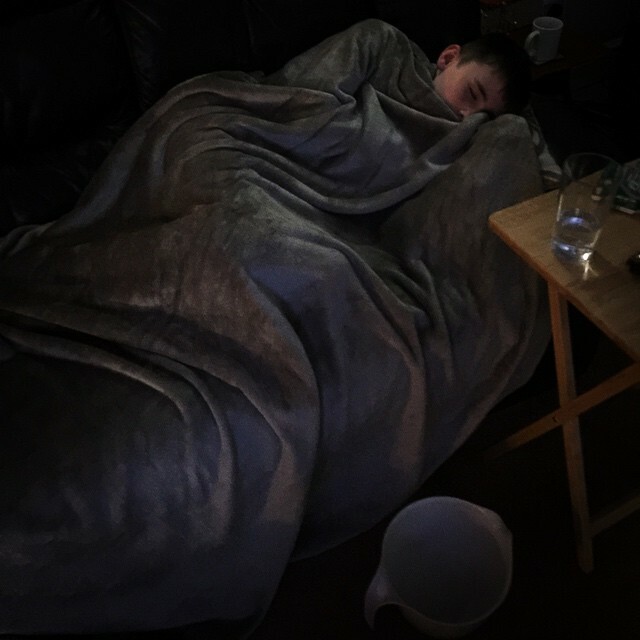 Bradley has been feeling rather unwell this week and got great comfort from the blanket, he said “it’s lovely, warm and cosy” you have a choice of two different colour blankets, the choice being either Moon Rock or Antique Silver, we have the Moon Rock colour. The blanket is 100% polyester and with the bonus of it being machine washable at 40 degrees. 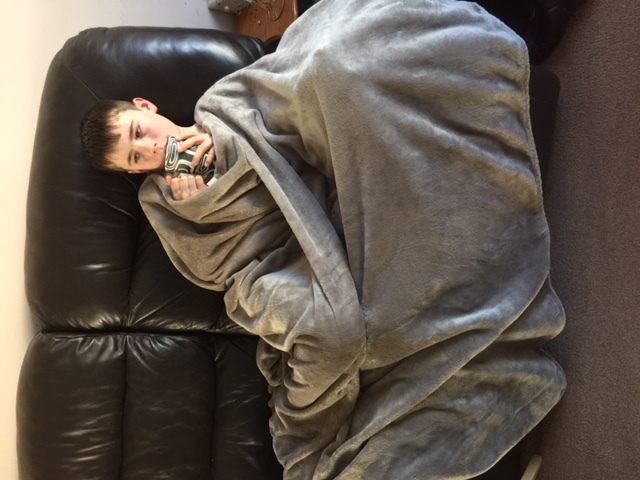 The blanket is a luxuriously soft fur fleece, known as heatweaver, this fleece blanket has been developed with the main intention of being efficient at retaining heat, which is why it has the official tog rating of 1.4. On cold, wet wintry days/nights we will be keeping warm and dry with the help of our heat holder blanket. The first thing the boys do when they come home is warm up with the blanket and watch tv with a nice hot chocolate. Do you have a favourite blanket that you love? Disclaimer: we were sent a heat holder snuggle-up blanket for the purpose of our review, all thoughts and opinions are 100% our own. I am a lover of personalised gifts as I think they are a nice personal and special gift to receive, they are gifts I not only like to receive but something I love to give as well. Giving a personalised gift makes a unique and personal gift for that person and I love that personal touch, it makes it all the more special. For previous christmas gifts we have had canvases and key rings made, they was gifts that made grandparents smile and treasure. This year we can make special gifts with the help of Snapfish because they offer so much in the way of: Photobooks, calendars, cards, wallart, mugs, acrylics, coasters, and much more, you can find a list of all products here, all of which you can add your special memories to that are so much fun to sit and make. 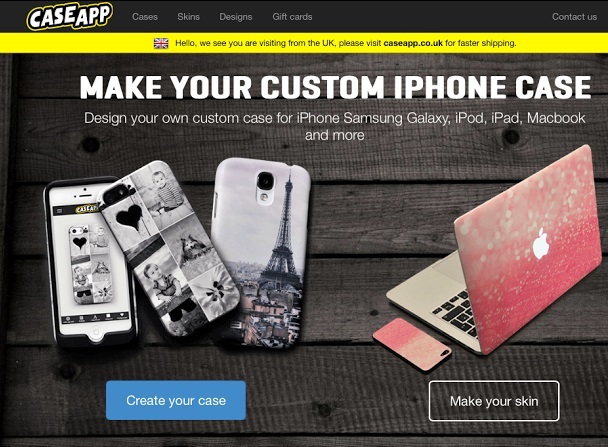 Creating personalised gifts/items is fairly easy to do, you just simply upload what photos you would like to use to the snapfish website, click on what product you would like to personalise, then just simply click on what photos you have uploaded to use. Once you have chosen what product you would like to use, then uploaded your photos to that product, you can then have the option to pick a background to use and even add text if you wish to make it extra special and personal, it is very simple to do and you get step by step instructions on the website to help you. We chose to have a puzzle made out of one of our favourite holiday pictures, we chose to have a puzzle made as this is something we thought would make a great gift this christmas. We thought this would be a gift that would bring smiles all round at christmas. 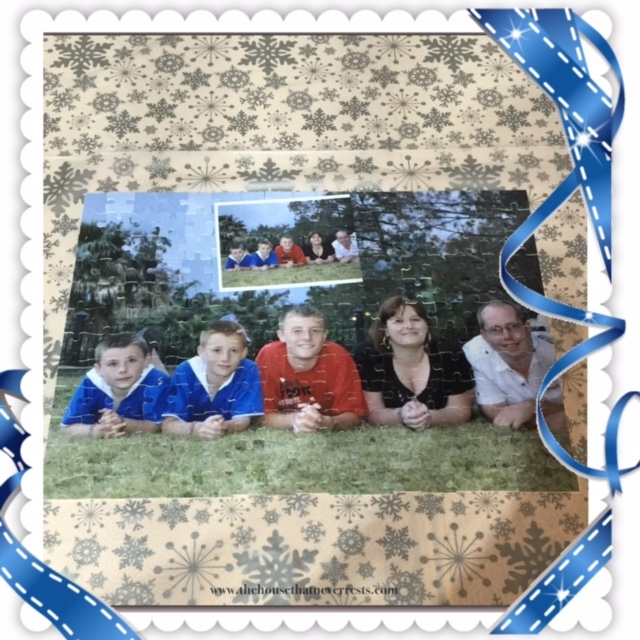 If making a personalised gift is something you would like to do, head on over to snapfish and have a look at the great products they have, you will be amazed at what you can make out of your favourite photos. Disclaimer: we was given a credit note to spend with snapfish for the purpose of our review, all thoughts and opinions are 100% our own. 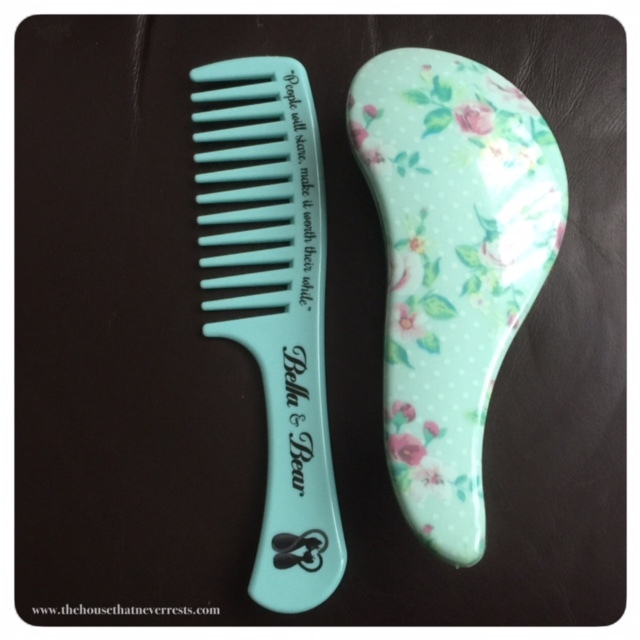 Having very thick hair can be horrid when trying to de-tangle and get rid of those horrid knots. I have many horrid memories of this as a child, screaming as my mum tried to de-tangle my hair, OUCH! (I still have the odd screams now as an adult if I’m honest) not nice memories but I am sure most of us women have them. So if like me and you have long thick hair you will agree that brushing can be is a problem, making sure I have brushed my hair through properly takes forever and is very time-consuming and very annoying when in a rush to go out. 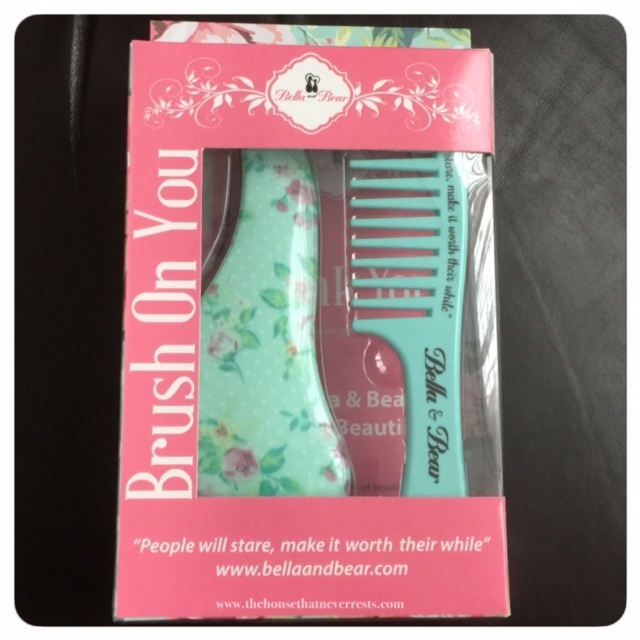 So to try to help solve this problem I have been trialing the Bella and Bear de-tangling set this set consists of a wide-toothed comb and a detangling Brush. 6. And even long thick hair……bonus! This set glides through my hair with ease, there has been no need to pull and there has not been any screams as yet! 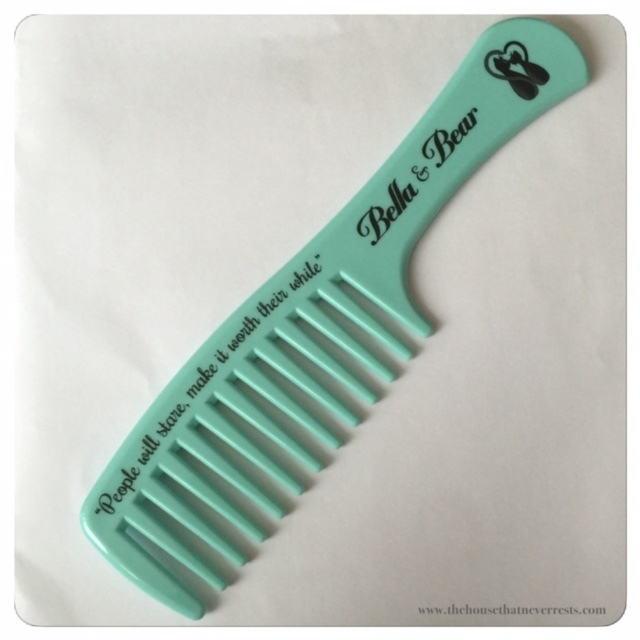 This comb itself has an easy grip handle, features Bella and Bears logo, it also has wide teeth, making it easy to glide through your hair pain-free. The set comes in a lovely gift box and would make a lovely gift for an adult or child that would love to brush with ease. The brush has firm but not harsh cone-shaped bristles without an end bead so you so you can brush and glide through those horrid tangles. 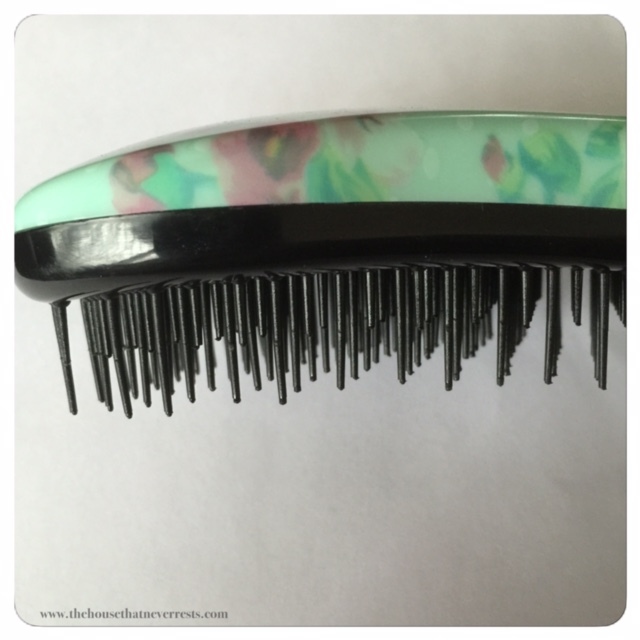 The brush is gentle but effective and you do not see big chunks of your hair in the brush after brushing, this happened to me fairly often with my old brush and it use to scare me. Now I have this set I am now brushing with ease. Disclaimer: We was sent a Bella and Bear detangling set for the purpose of our review, all thoughts and opinions are 100% our own. Following on from Buddy’s visit to pets at home, we are now into week 2, taking onboard all the great advice we had received from his nutrition consultation, we have been weaning Buddy slowly off his old brand of food and slowly onto his new brand of food called Wainwright’s, we have done so by still feeding him his old food but by taking away some off his old food and replace it with some of his new food. We was advised to move Buddy slowly off his old food and onto his new food as this should help him to adjust to it slowly and save him from an upset stomach, we thought this was great advice and something we hadn’t done before in the past…and yes he did end up with an upset stomach, we did not want a repeat of this so we listened to the advice given to help us with the weaning process. So how did we get on weaning Buddy slowly off his food…..Buddy has been very poorly, we had some very sad news relating to a lump on his toe, ending in Buddy having to have his toe amputated, this has been a very emotional time for all of us and we have pulled together to get Buddy through this. he has been on anti biotic’s and strong pain killers since then and is now coming to the end of his course, this week has been very hard for me to give full judgement on as seeing Buddy so poorly has been awful, we had already started the weaning process or we would have waited until he had recovered so we thought it would be best to continue. What we can say is he has adjusted rather well so far to the different food and no food has been left in the food dish old food or new, so this is a very positive sign that he likes the new brand of food, when he was on his old brand of food most days he would return to his food dish and cry for more food and there has been no sign of this as yet, Buddy has not wanted much food due to his medication making him drowsy but he has been eating little but often. He has had a little upset stomach but this could be caused by his medication he has currently been on. Buddy has been sleeping a lot since his operation, so I can’t comment as yet to what his behaviour is like since the food change, he has been on very strong tablets this week to help him to rest and recover from his operation, he his now coming to an end of his medication and is seeming more himself again so hopefully fingers crossed his energy levels will improve and I can give more of a judgement on the food change once he is himself again. Have you had a nutrition consultation at pets at home for your pet? did I mention to you that it is free. 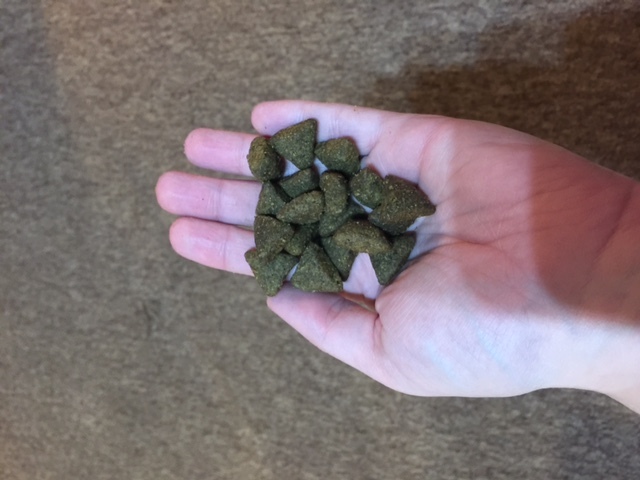 If you have had a nutrition consultation for your pet did the advice given help? Disclaimer: we received some Wainwrights food for the purpose of this challenge, all thoughts and opinions are 100% our own. 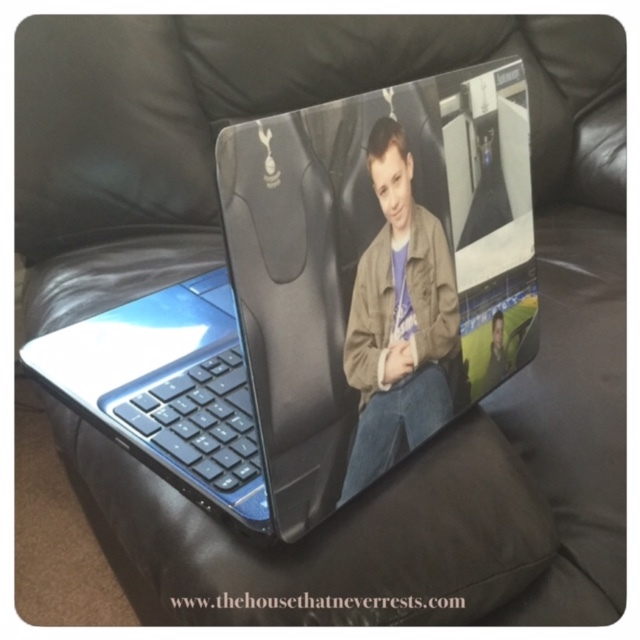 Anyone that knows Lee will know how mad he is about football, so having his favourite pictures made into unique and personal laptop skins for his very own laptop would be something I knew he would love. 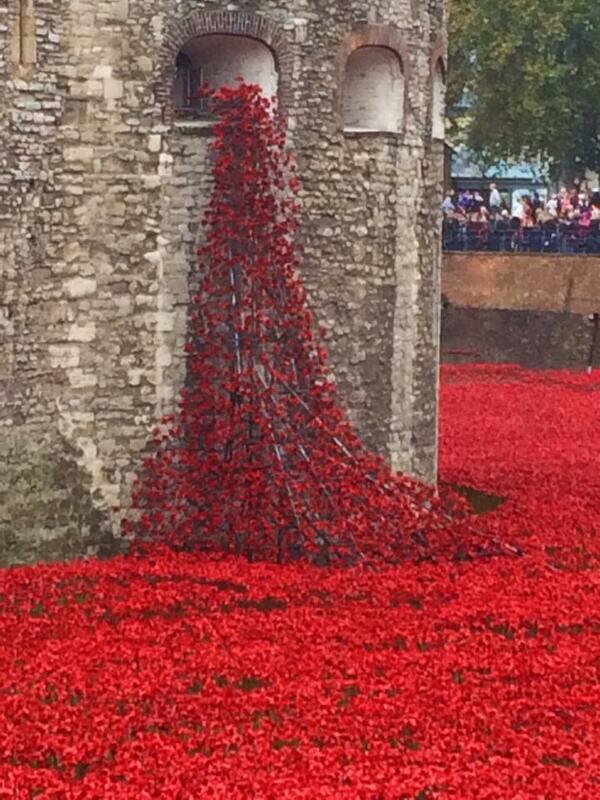 Well what teenager wouldn’t want his personal football memories somewhere he could see daily and be proud of. The skin gives Lee’s laptop a personal look whilst protecting it, as I am sure you can imagine like any other teenager Lee’s laptop gets left on the floor, sofa, kitchen worktop and any other place it shouldn’t be left so protecting it in a fun way is great. 1. first of all click on what option you want, either phone case or skin. 2. I wanted to create a laptop skin so I scrolled down to laptop. 3. 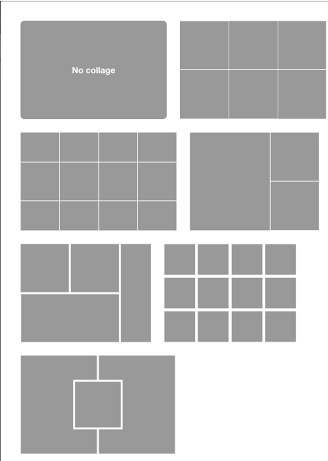 I then clicked on the collage tab and chose what collage I wanted to use. 4. I then started to choose what pictures I wanted to use and uploaded them to the collage. Once you have chosen your favourite pictures you can then decide if you would like to add any clip art, text or even a background. Once you have finished designing you can then click preview and check your work before purchasing. The laptop skin works just like a protective sticker and as I found out is very forgiving if you do not get it in the right position first time. Removal is fairly simple, you can just un-stick and try again, there is no horrible residue left behind once removed which is great. The skin itself is protected as it is covered in a matte laminate, so we should get some good wear out of the skin. We chose to design a laptop skin but if you would like a phone case then the process is the same, but with more collages on offer. Head over to Case App if you would like to design a case or skin. These would make a perfect personalised christmas gift this christmas. Now how would you like the chance to win a case or skin? For your chance to win please enter via the rafflecopter form below, please remember all entries will be checked. Disclaimer: we received a laptop skin for the purpose of this review/giveaway, all thoughts and opinions are 100% our own. We have been keeping a little ok BIG secret from everyone. The reason we have kept it a big secret is because it took the pressure off Bradley incase he didn’t pass to the next stage. We applied to a couple of companies for child modelling as we thought Brad would be perfect for this. Brad has shown signs of being a lover of the camera and loves to do poses, anyone who knows Brad will know he is not a shy person at all and is always in front of the mirror doing his hair, trialing different styles etc. In Brads words he’s got to look cool. 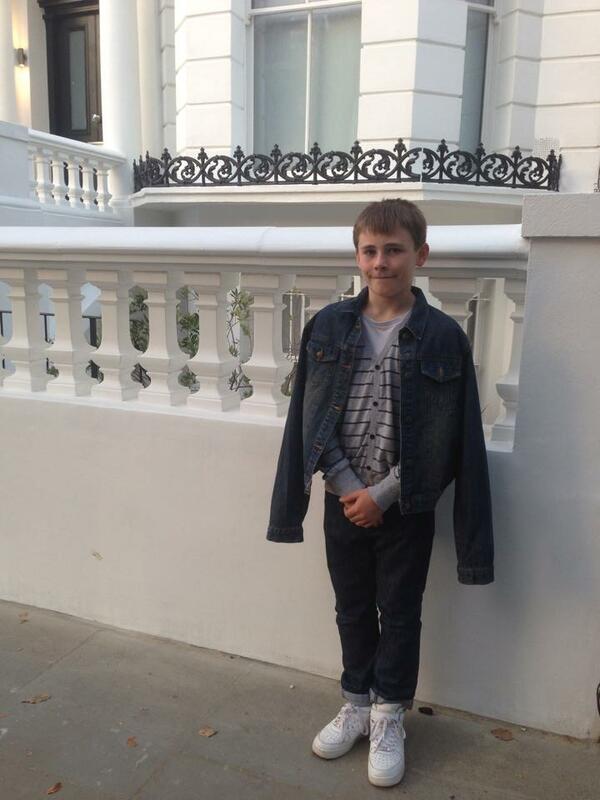 We sent a picture of Bradley over to a few companies and one day the phone rang and it was a company saying they loved the photo we had sent in and they would love to invite Brad along to a trial photo shoot, this shoot would be around 4 hours long and he would need at least 5-7 changes of clothes. We waited for Brad to return home from school, we sat him down and explained to him that a company had got back to us, we also explained what would be involved and asked of him, we asked if he would like to go along and have a trial, Brad was over the moon and excited will not even come close to how he reacted, he was straight up practicing his poses and searching his wardrobe for what he was to take to his photo shoot. The photo shoot was for Brad to trial what it will be like having a photo shoot and to see what it is like in a studio. It was also a chance for the company to see if Brad had what it takes to make it in the modelling industry. Since we had told Brad about the shoot, out came his diary and he had marked the date and time down, he had been chatting away about it to us, the neighbours and anyone close by since he had been told about the call. We had asked him a few times if he was still sure he wanted to go ahead with it all, we also repeatedly told him he can back out at anytime, he was certain that he wanted to go ahead, so he did with our support, and guess what………… he got accepted, he is so over joyed and we are so proud of him, he showed no signs of nerves and enjoyed every minute of it, he was in control of the whole shoot and was told he can stop at anytime, but he wanted to continue, we are so pleased for him. Please join us by wishing this little champ good luck! I have been tagged by Kate’s Wonderland in the getting to know me questions tag, I’ve 30 questions to answer…..so here goes. 1. What was the last TV show you watched? I’m a celebrity get me out of here. 2. What was the last alcoholic beverage you consumed? 3. Have you ever lied to get out of a date or relationship? 4. What do you think of velvet knickers? 5. have you ever been in the back of a police car? Yes, but not for being arrested or anything like that. 6. Post a pic of something you love? 8. What do you normally order in a bar/pub? A nice big glass of wine. 9. Have you ever wanted to be a police officer? 10. What is your normal everyday dress code? 11. Do you lift weights? 12. Sherlock or Dr Who? 13. Do you know self-defence? No but would love to learn. 14. What fandoms are you apart of? 15. Who is your OTP (one true pairing) ? 18. What countries have you been to? 19. Do you think schools should bring back corporal punishment? 20. Post a pic of something completely random? 21. Have you ever eaten a whole pizza to your self? 22. Do you look after your body? Not as much as I should do, but I am in the process of loosing weight, I have currently lost just over one stone so far and I am still going. My aim is about four stone. 23. How much sleep do you get a night? Not as much as I would like. 24. If you could take only one trip with the Doctor in his Tardis where would you ask him to take you? Back to when my kid’s was babies. 25. Do you think women look good in suits? 27. What is your favourite type of cake? 28. Who was the last celebrity you spoke to and what did you say? Linda Lusardi. We chatted about her luxury skin care range. 29. Do you get starstruck? 30. Who was your favourite author as a child? If you would like to join in and answer the same questions. Are you a Emmerdale fan? we are, well most of our family are to be honest. I have become a big fan of Emmerdale due to my mum watching it when I was a child and now my kids have become big fans too. 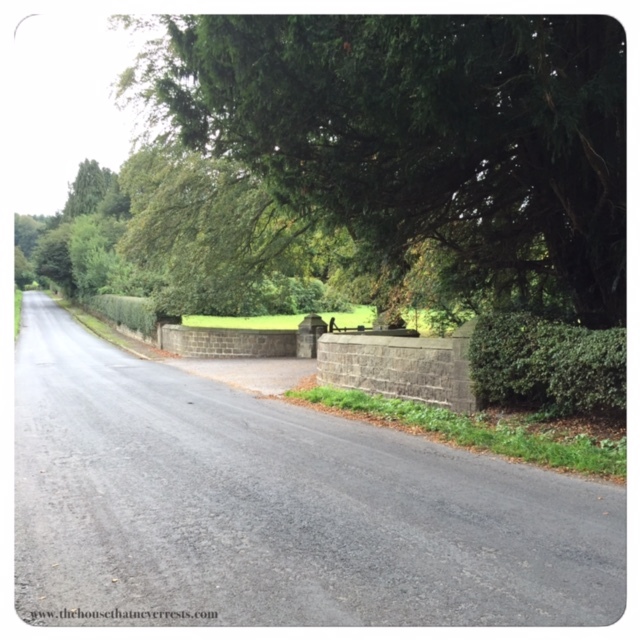 We was lucky enough to be Travelling local enough to go on a locations tour and visit where filming had been done and in some cases still get used for filming. 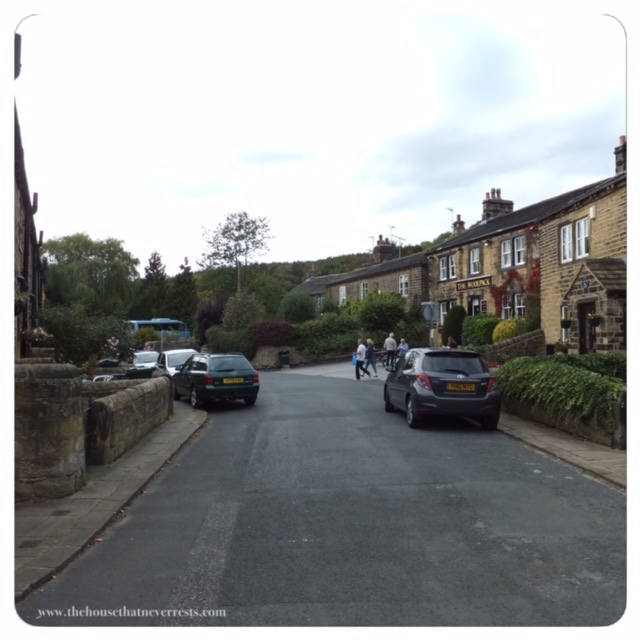 Whilst on tour we learnt about when filming first started and where. Do you know when the first episode of Emmerdale farm was screened? it was screened at 1.30pm in a little village of Arncliffe in Littondale on October 16th 1972. Time to test your knowledge a little, do you remember who lived here? This was Annie’s house, a lot of filming was done in her kitchen. We also learned about when weddings took place and when some of the cast joined. We all love a good TV wedding, Emmerdale has averaged about one wedding a year, do you know when the first Emmerdale wedding was and who it was that married? 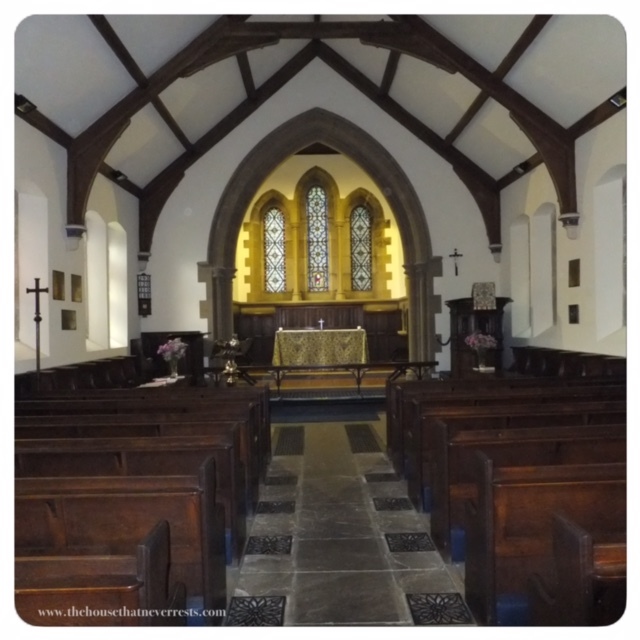 this was March 1973 when blacksmith Frank Blakey married Janie Harker in Beckindale church. 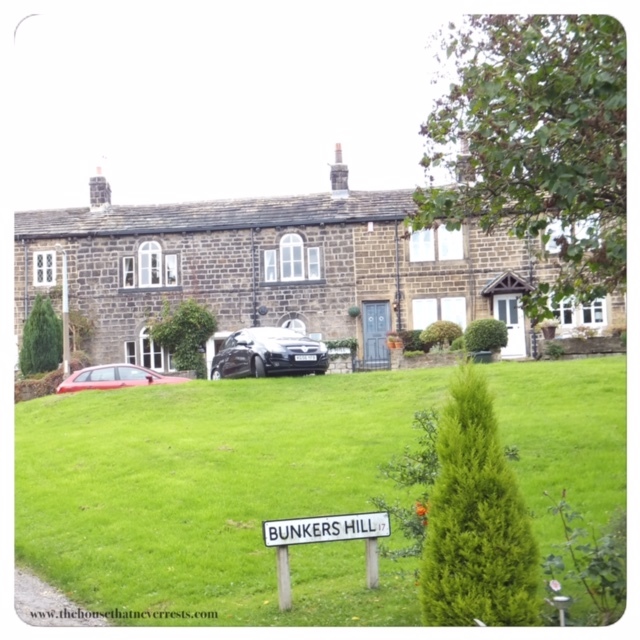 In 1976 the location of filming moved from Arncliffe to Esholt as Emmerdale fans began to seek out the village. Do you all remember the loveable Seth Armstrong? he joined the cast in 1979, do you remember what his job was? he was the gamekeeper. Was you tuned in to the 1000th episode? this was November 1985, by this time the programme appeared regularly in the top 10 and was watched by millions. Do you know the name of this home ? 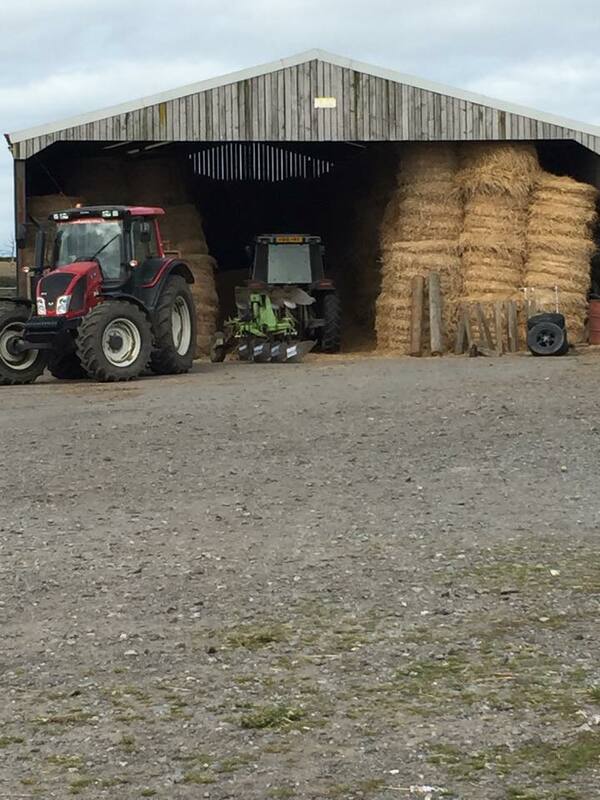 Yes this is known as Home Farm, somewhere we all wish we could live right! 1989 was the year in which “farm” was dropped from Emmerdales title and production moved to a special studio in Sunny Bank Mill at Farsley. Do you remember the Tate family? 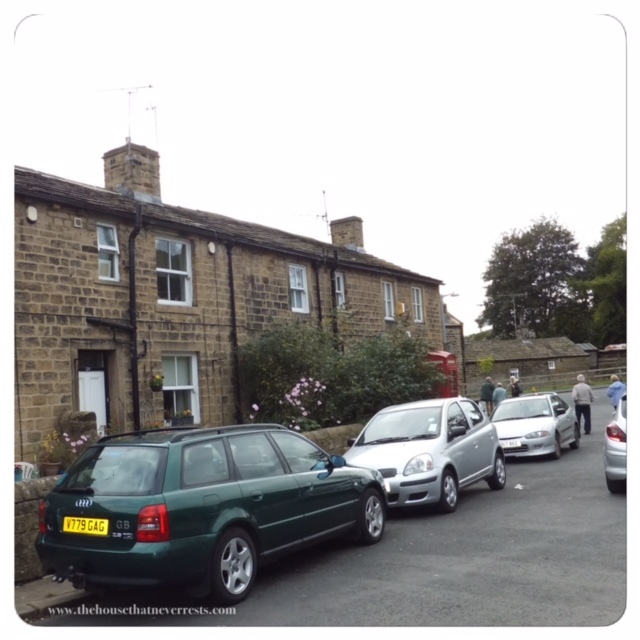 this was also the year they arrived in Emmerdale. 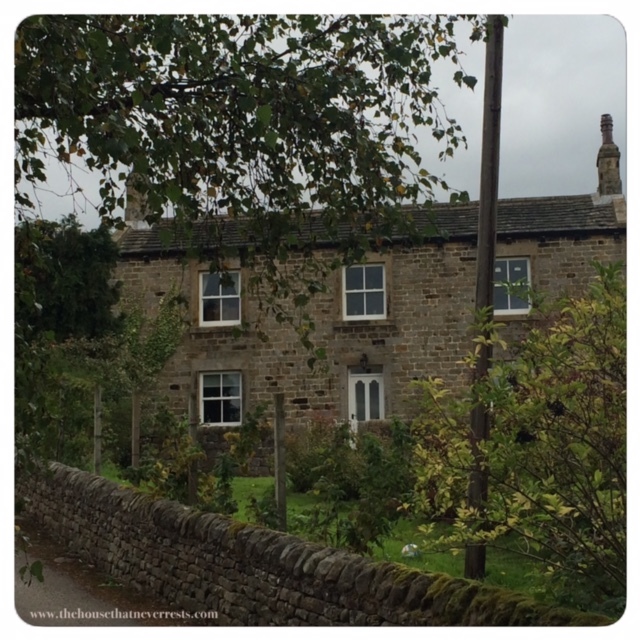 Do you recognise this farm? This is known as Butlers farm. 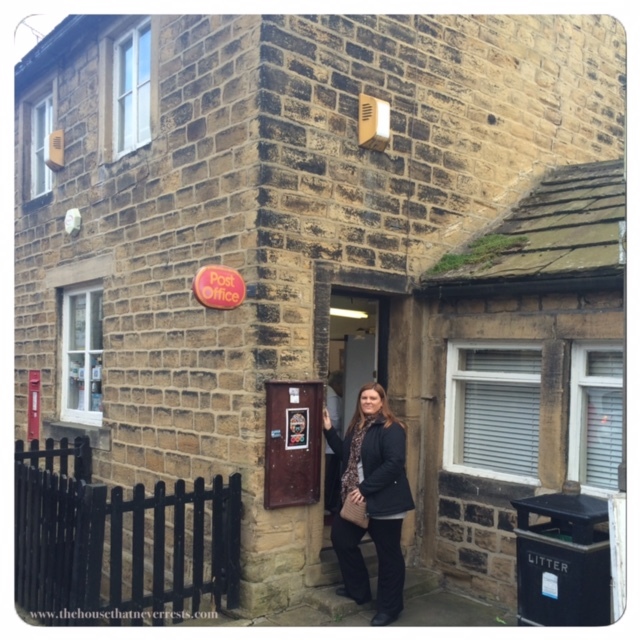 From then there have been fires, shock confessions, kidnappings, romances, weddings, very sad miscarriages, affairs, there is always something exciting happening in Emmerdale. 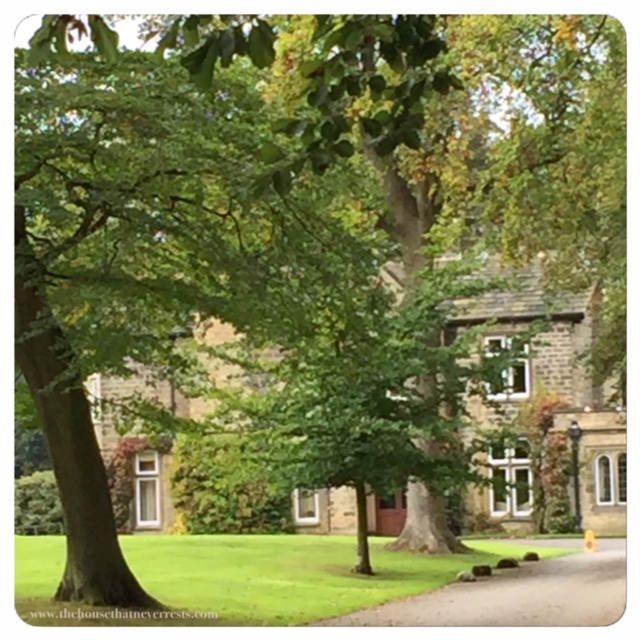 Esholt is the home of where Emmerdale was filmed for twenty-five years, this is where you will find. 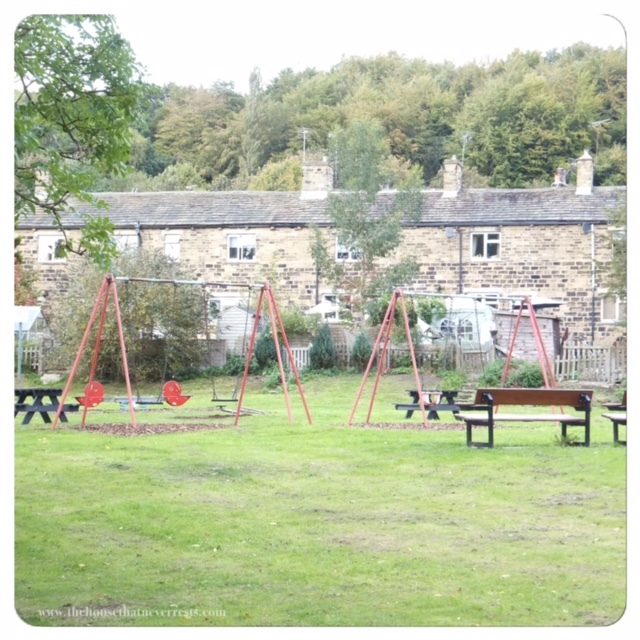 The heart of the village and centre of many fine story lines. Owned by the Windsor family for many years. 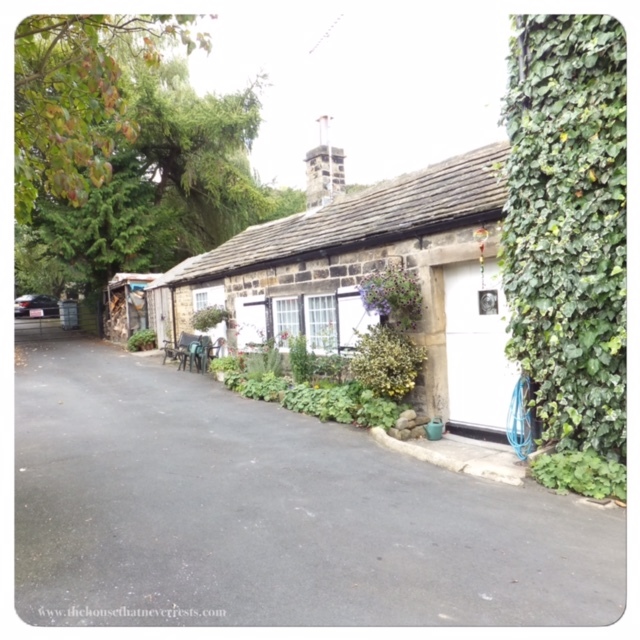 This was used as Demdyke Row, residents included, Seth Armstrong, Jackie Merrick lodging with Joe Sugden, and later with Kathy when Joe signed the cottage over to them. Demdyke Row was devasted by the plane crash which killed six villagers in December 1993. This cottage has starred as the residence of many cast members. The Vets used by Paddy Kirk. Featured occasionally throughout the series. 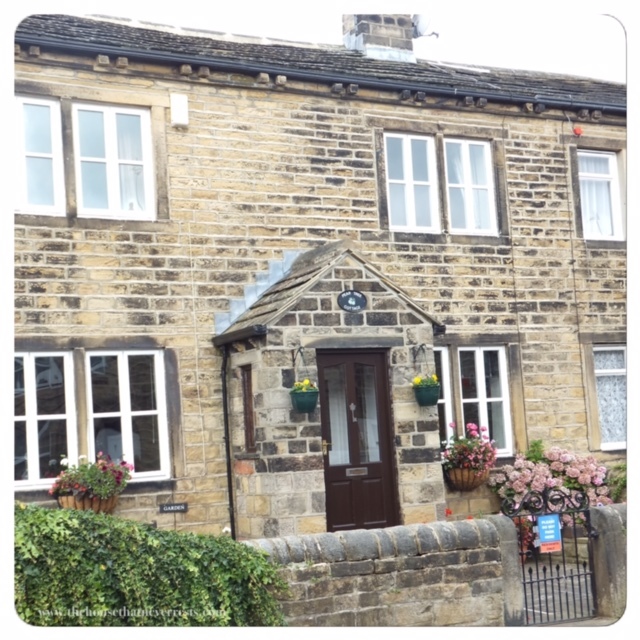 Just opposite the Woolpack were the homes of Betty Eagleton, Caroline Bates, and Eric Pollard. 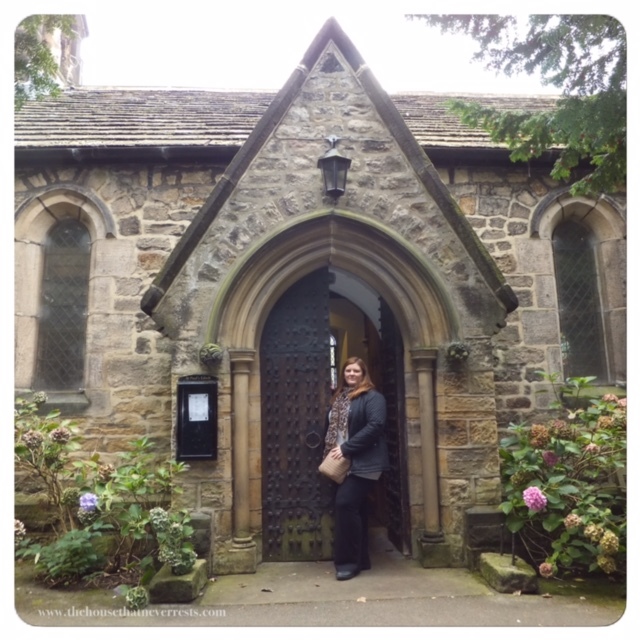 Known as St Mary’s church, it has been scene for many weddings and funeral services. 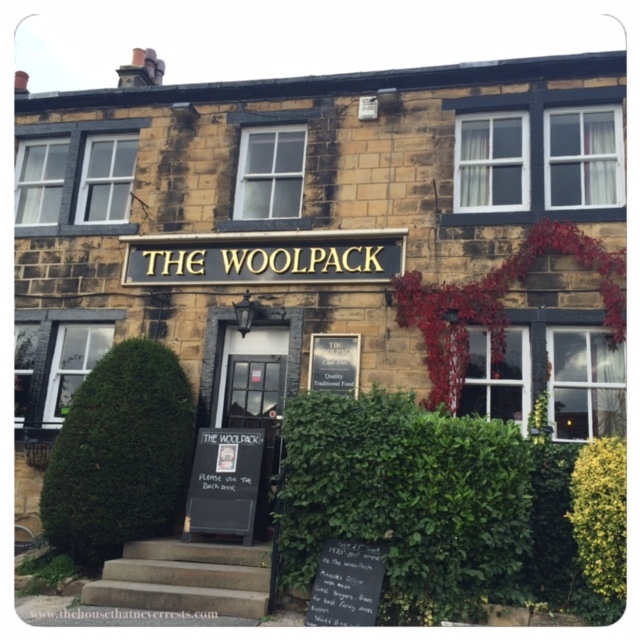 Walking round a village that I have watched on television for many years is such an awesome experience, we was able to go into the Woolpack and order a drink, we could even go into the Post Office and purchase things. If this is something you would love to experience the tour is about four hours long and the tour guides are extremely friendly and happy to answer any questions you may have. Here is a clip of Emmerdales first episode. Disclaimer: We received two tickets to go on a locations tour for purpose of our review, all thoughts and opinions are 100% our own. I don’t know if you are aware but Buddy suffers with skin allergies and is allergic to beef and chicken, we found out about his skin allergies a few years ago following a blood test we requested at the vets, he also suffers with hip dysplasia which we found out when he was unwell at the age of 4. 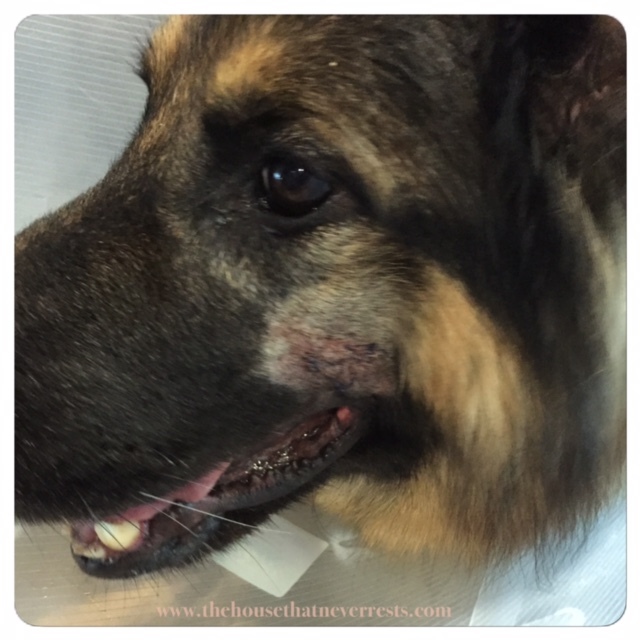 We was recently invited along to our local pets at home for a nutrition consultation, where we spoke about Buddy’s health, his weight was checked and it was like a dog MOT where they checked his nails, ears, fur, eyes and also his joints. Ian said Buddy gets a better check with pets at home than he does at our GP surgery. We was asked a few questions about Buddy’s skin allergy, the food he is currently on and Buddy’s bowel movements, after a long discussion we was advised that the food he was currently on was probably not the best one for Buddy due to all the added extras in the food which is probably not good with his allergies. Anyway…..after a long discussion we had a good look at all the other foods on offer in store and Wainwrights seems like the best option to try Buddy on and see how he goes, there seems to be a lot more of a choice for him in this food range, unlike the other range he was on there was very little in variety for him with his known allergies. We was informed that changing his food over from his old food to the new food should be done slowly, by adding a little of his new food to replace some of his old food and gradually wean him off his old food onto the new one. We was informed that just changing straight over could upset his stomach and this is something we do not want. pets at home nutrition consultation has been a real eye opener for us and we learned some new interesting facts during our consultation. With the help and advice we received we will hopefully be moving Buddy over to Wainwrights with Buddy agreeing of course! We will be updating you on the progress of Buddy’s food change shortly, but in the mean time have you ever considered a nutrition consultation for your pets and was you aware that pets at home offer them? Disclaimer: Buddy received a free consultation and was supplied with enough food for the duration of the challenge. All thoughts and opinions are 100% our own. Trust is something we had in the kennels we had chosen for our loving dog Buddy, we had dropped him there Saturday as we was having a family party to celebrate our sons 18th birthday, an hour later while we was getting things ready for the party we had a call saying there has been an accident and Buddy has two cuts to his face that is rather deep and no one knows how this had happened. Ian went straight back to collect Buddy and took him to the vets where he was informed Buddy will have to stay with them, be sedated and have it cleaned up and stitches will be needed. Our poor dog we still to this day have no answers on what or how this has happened to our family pet. 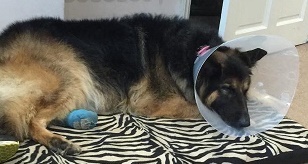 This has been a very upsetting time seeing our very much-loved dog in pain, we feel really guilty as we had put him in the kennels, but we had put him there thinking he would be looked after and never dreamed of him being injured like this. We have now lost trust in using kennels and in future Buddy will stay where we know he will be loved, looked after and kept safe. 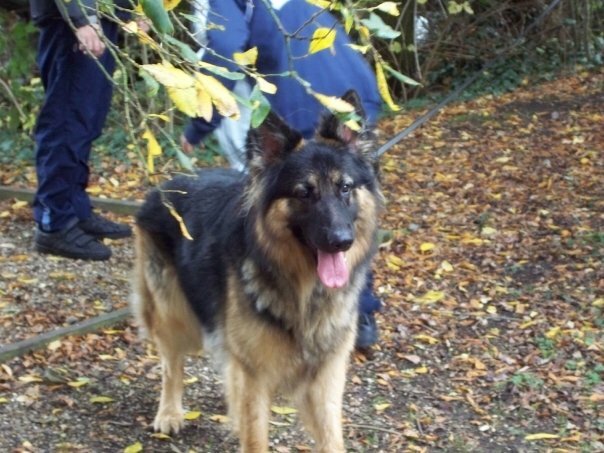 He is now 8 years old and we have been using kennels for buddy since he was a pup and we have never had any problems in the past. Our old kennels we had used in the past has recently closed down (Hence the recent change in kennels) the kennels he was injured at was Buddy’s second stay at. We have filed a complaint and we are waiting an outcome of that, we have never been in this situation before so we are not 100% sure on the procedure, but one thing we do know is that we are not going to let this go as this could happen again to another poor animal. We put Buddy in the kennels for one night expecting him to be looked after and kept safe, but one hour later we have a call, his injured, needing sedation and stitches to his face. All trust in kennels have now gone. 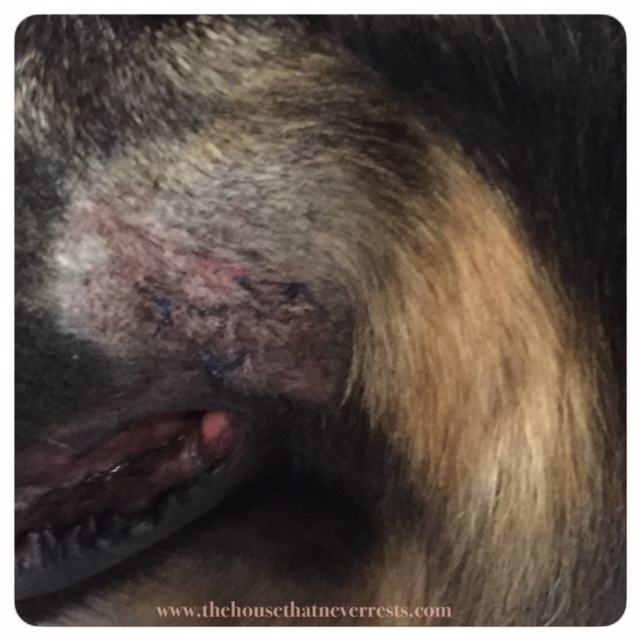 Have you ever had any bad experiences of using kennels? Ahoy there! the Cutty Sark are looking for apprentices that are hard-working and are ready to sail the seas all they way to Australia. Do you know anyone up for the challenge? the Cutty Sark is ready to set sail on yet another epic journey and is in need of apprentices fast. This will be no cruise and your skills and efforts will be put to the test, the crew is in need of help fast. The Cutty Sark have joined forces with Gamar and created a unique gaming experience. The game enables people to become part of the crew; they can unfurl the sails, steer the ship, ring the bell and even catch mischievous monkeys! This is a fantastic opportunity for todays children to step back in time and experience what life was like for those who sailed the Cutty Sark over 100 years ago. During your journey you will be set important tasks to complete throughout the ship, you will need to remain focused at all times,but be warned captain Woodget will be judging your efforts and he is a hard man to please. You will need to prove you are handy in all aspects of the ship and indispensable to all on-board. The gamar app is very clever as it interacts with real-life objects and environments, it triggers interactive, augmented reality gaming experiences that are then played through smart phones and tablets. 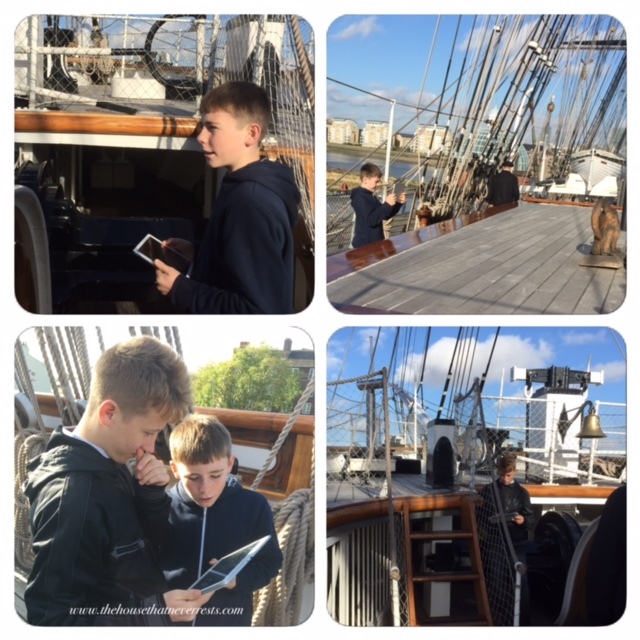 Lee and Bradley found this a fun learning experience and it helped them both understand what it would have been like for those who sailed the Cutty Sark all those years ago. Lee and Bradley enjoyed working on the set tasks together and had great fun learning about the day-to-day life of a sailor on board, they loved bringing the ship to life using the Gamar app and experiencing the thrill and hard work of life on board as part of the crew. Are you ready to be put to the test by Captain Woodget ? if so you can download the free Gamar app and then Captain Woodget’s Apprentice can be purchased at £2.49. 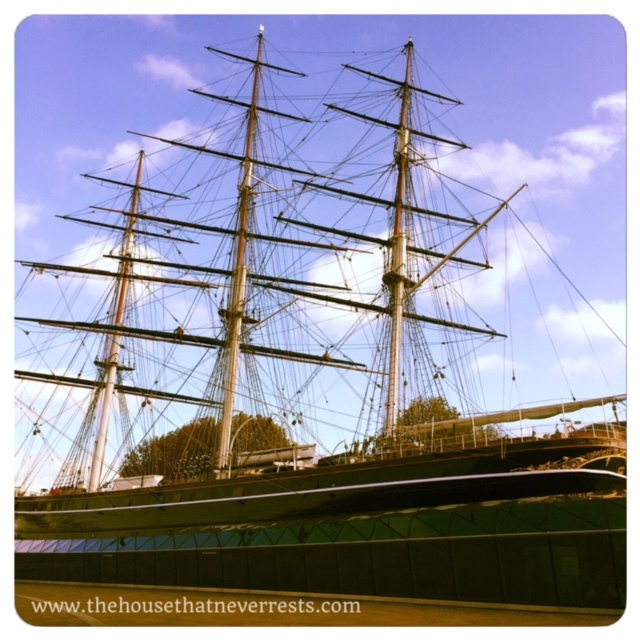 So do you dare put yourselves to the challenge upon the Cutty Sark, we did. 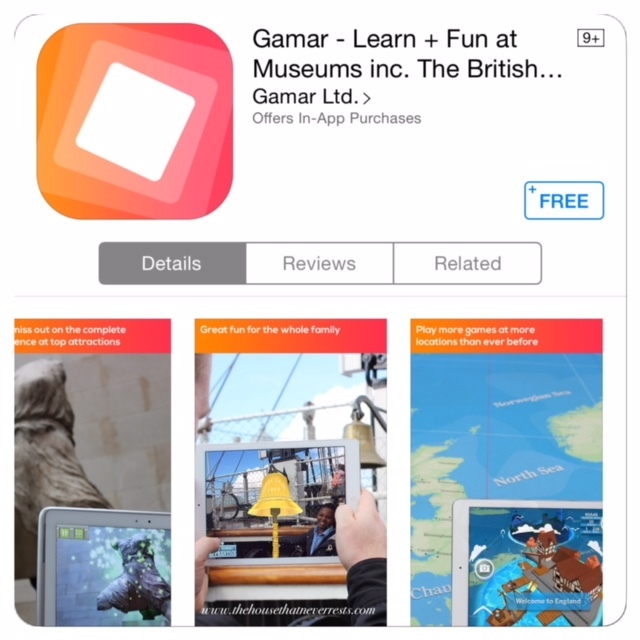 The Gamar app is a great way to turn iconic London attractions into interactive adventure playgrounds that are educational, unique, popular, interactive and most of all fun for all. You can use your mobile phone/tablet to explore, discover and learn, after you even get the option to share with the community how cool is that. Disclaimer: We was invited along to trial the Captain Woodgets Apprentice game on the Cutty Sark for the purpose of this review, all thoughts and opinions are our own.